At ThreeEQ, we have helped nearly 100% of our high-achieving students get admitted to Ivy League universities and other best-fit elite colleges. Our unparalleled mentoring method also cultivates a strong next-generation leadership mindset with powerful lifelong benefits for our students. Success stories abound! …without pressuring their teen children anymore than they have to. What I enjoy the most is seeing our students achieve great life-stage outcomes, transform upward as rising leaders and happy people, and gain powerful lifelong benefits with our compassionate, outcomes-focused, and purposeful mentorship. 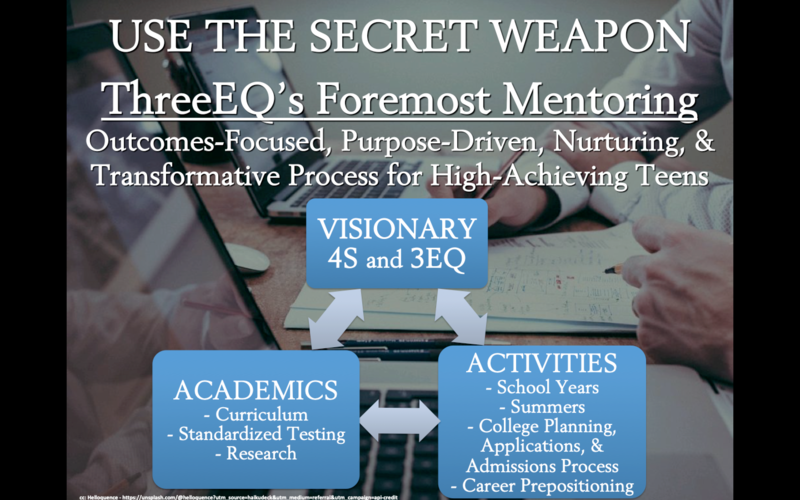 ThreeEQ's mentoring framework and process are effective, inspiring, holistic, data-driven, and personalized at a quality level unmatched at even top private schools. College is part of the journey but not the destination. Think not only college admissions but also through college, career, and life! and mentoring services for select driven teen and young adult children of caring parents. 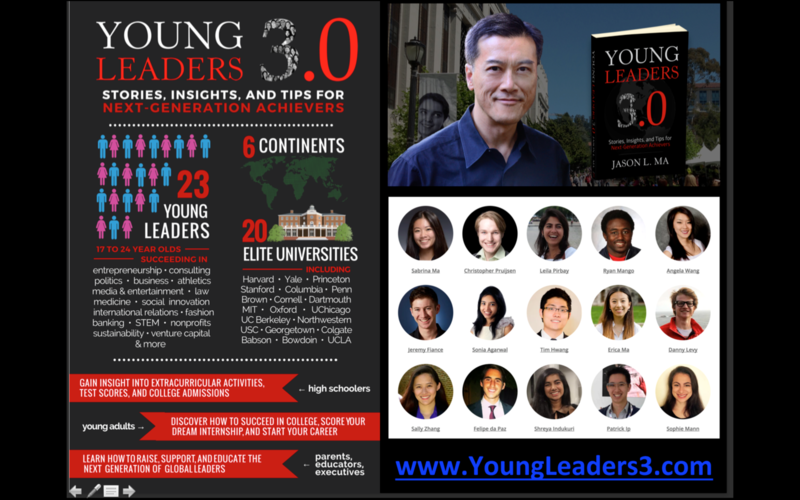 On elite college admissions results, our exceptional track record includes having helped nearly 100% of our high-achieving students get admitted to their share of best-fit elite colleges and universities—all Ivy League schools (Brown, Columbia, Cornell, Dartmouth, Harvard, Penn/Wharton, Princeton, and Yale), Stanford, MIT, Caltech, UChicago, UC Berkeley (Berkeley Engineering and Haas School of Business), Duke, Northwestern, Johns Hopkins, Georgetown, WashU, Vanderbilt, Rice, Notre Dame, Carnegie Mellon, UCLA, USC, Emory, Williams, Amherst, Swarthmore, Pomona, Harvey Mudd, Claremont McKenna, Bowdoin, Wellesley, and other top-tier research universities and liberal arts colleges. IN SUM, our client students and parents enjoy maximizing wins and success, minimizing pain and opportunity costs, and getting the certainty and peace of mind by taking advantage of ThreeEQ’s foremost and compassionate mentorship. They enjoy the mutual integrity, authenticity, and inspiration. A common by-product benefit is that our client family internal relationships become even better with our involvement. Book a call or online Zoom meeting via ThreeEQ.com/apply with us to listen, learn, and discuss if we can help your child, and if so, how best to help you all. After you schedule a date/time that works for your child, you, and your spouse (if he/she must be consulted), you’ll be directed to submit a short application form that’ll help us prepare for the call. We require that ALL of you be present for the call. We can meet in my online Zoom room while you all are in different locations worldwide. It will be the BEST time your folks will have spent for your child’s present and future! "Mr. Ma has had a tremendous impact on my development as a person. Through our coaching sessions, which felt like conversations with a friend, Mr. Ma guided me to set aggressive goals and expect more of myself. After four years of working with Mr. Ma as my mentor, I can attest to his persuasive and engaging personality. He took the time to understand my unique skills and perspectives and helped me sharpen my focus and drive for all-around, genuine excellence. My interaction with Mr. Ma has enriched my understanding of the key drivers for long-term success — not just in business but in life. My relationship with him has grown from him being a mentor to being a true friend." "Mr. Ma is your friend who guides you through the whole stress of getting into college and into your future. He helps you figure outauthentically who you are and who you want to be and really discover the true leader inside of you. He knows how to bring out the leader inside of anyone! Getting into college is just the beginning. 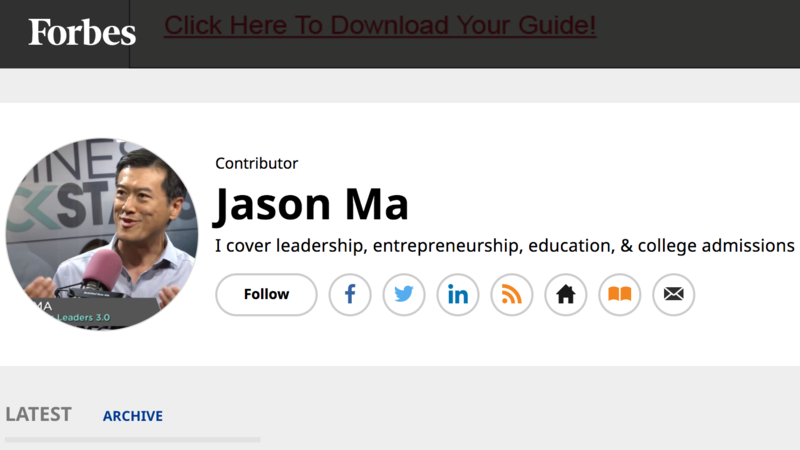 Mr. Ma is a great mentor and a great guy…he knows it so well! There’s nothing more that you can ask for…"
"Mr. Ma has been a major support system for me since I was a high school student. As an upperclassman at UC Berkeley, I continue treasuring his mentorship of me. He has a heart for coaching students like myself to help them realize their full potential. He cares deeply about his students and their well being and future. One of my memorable experiences with Mr. Ma was that he selflessly worked late into the night on New Year’s Eve with his students. This speaks to his dedication and passion toward helping students succeed. I am very grateful for all the help that I have received from Mr. Ma." "I want to thank you with my innermost sincerity for all that you have done in guiding my academic planning, personal development and college applications. Working with you has been more than inspiring and rewarding. The scene of my first meeting you and weeping in front of you in my sophomore year is deeply imprinted in my heart. It is by no means an exaggeration to attribute the stimulus of my turning point in life to you and your team. When I deviated from the light of learning and lost my direction with a confounded mind, it was you who motivated me to embrace my former assiduity; it was you who showed me the path to success; and it was you who encouraged me to indefatigably run toward my future. …..The innumerable times of commenting on and re-proofreading essays, the scrupulous examinations of applications, the critical updates and follow-ups, the eye-opening ideas and suggestions, the more than strong sense of responsibility, the admirable mission beyond that about responsibility… My experience with you has been a life-changing one, with or without the final results." "I want to thank you for everything you’ve done for me, from helping with my applications to helping resolve my financial aid situation. The latter was not something that you had to do, yet you still went out of your way to help me during a difficult crisis. I am forever grateful for your help, and I know that my parents are grateful too." "I never thought I would be sending you such an email at the conclusion of this admissions cycle, but I am. I would like to inform you that I have, I quote exactly, “been offered a place in the Class of 2020 at Duke University.” A dream come true for me, and you cannot imagine my joy and excitement as I saw those words on the portal. More importantly, I would like to express my sincere thanks to you for everything you have done for me in the process of this application — regardless of the result of my applications. …..I want to say thank you for being so dedicated and 110% serious about helping me not only to gain admission, but also, more importantly, to improve and become a better, more competent person, for being such an on-the-ball and responsible mentor (even more than me at times! ), and for teaching me so much about how to succeed, be driven, and be passionate. I feel deeply grateful and extremely humbled to have had such a selfless, outstanding mentor. You are an inspiration to me in many ways, and I value the lessons you have taught me. They will stay with me as I go to Duke and beyond. I sincerely hope to continue learning from you and keep in touch." Mr. Ma continues to support me in my professional endeavors. He has been tremendously helpful and has my full recommendation. "Mr. Ma provided me with the appropriate consulting advice to assist and expedite my university application process. Equipped with technical expertise and business-savvy, Mr. Ma helped me focus my applications in order to ensure my admittance to my school of choice—University of California, Berkeley. Mr. Ma’s engineering background resonated with my style of writing and thinking, and thus made the experience enjoyable and smooth. I still remember when we first met; he said, “Tim, do you want to be great? Well, everyone who wants to be great needs a coach. I’m your coach.” …..While operating in the stressful time of college application season, Mr. Ma displayed a calm demeanor while maintaining a cheerful attitude. His ability to display professionalism while dispelling all fears and worries was truly admirable. This duality has helped me throughout my college career to be successful in and out of the classroom. …..Having an Industrial Engineering and Operations Research (IEOR) background, Mr. Ma’s application of operational excellence allowed me to make smarter life choices and better tailor my interests. As a current mechanical engineering senior at the University of California, Berkeley, I endeavor to replicate Mr. Ma’s practice of operational excellence. His attention towards maximization and efficiency provides a basis for many of my engineering and career decisions. Ultimately, I thank Mr. Ma for his consulting advice, for without him, I would not be where I am today." "Mr. Ma’s mentorship is like navigation during a long sailing expedition. I have a destination in mind but adversities, like strong headwinds, have thrown me off and Mr. Ma’s guidance brings me back on course. Mr. Ma really cares and has diligently helped me make adjustments to my journey, which seemed subtle at first but have a large effect over time. The effects of the adjustments include my success in university admissions and, more importantly, the mindset to optimize my life. Many students are driven. But without a strategic, actionable, and individualized plan like the one Mr. Ma helps students craft, they will not achieve the same results." View http://threeeq.com/about/testimonials/, which includes a video of many more student testimonials, plus other testimonials! "My son was feeling great when he finished the call with you last evening. You have a gift in the way you work with these kids. I get it." "It was a pleasure for my wife and I to hear you speak at today’s Harvard Business School Association event. Your comment really resonated about how many of us would probably not even get into those schools again given the competitive environment today. True in my case, at least. 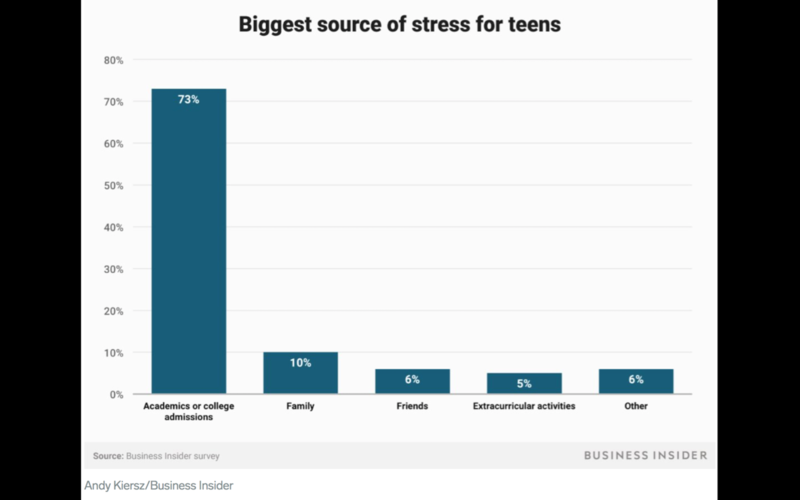 We also are fully bought into the idea that parents, despite their best intentions, are not always the ideal guides for their children when it comes to academic choices, extra-curricular activities, or college selection. As a result, we are looking for 3rd party mentoring for our highly self-driven, STEM-oriented sophomore daughter who seems to know that she wants to do something with ‘science’ in college but has not opened up about her interests or a set of target schools any further. Our daughter is happy and motivated at her private school. 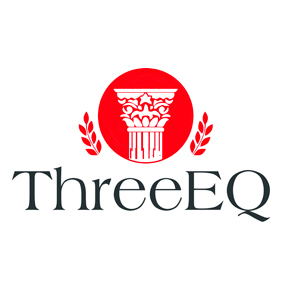 After hearing your talk today, we think ThreeEQ could help our daughter build her story and guide her through the college admissions process as an experienced 3rd party voice. In addition, ThreeEQ could provide valuable experience-based advice on which schools might be the best fit for her. "Thank you very much for all your help and guidance. We didn’t even know we must execute those requirements prior to meeting you. Without your help and wisdom, my son wouldn’t have applied to Stanford Early Action and wouldn’t have gotten in!" "My son is doing well. I believe his early consultation with you was very effective. Thanks again!!" "My daughter was accepted by UC Berkeley and NYU. She cannot get in Berkeley without your important and high quality guidance. Your great help would be always appreciated by our family! Take Care and thank you again for your great work! Thank you so much!" 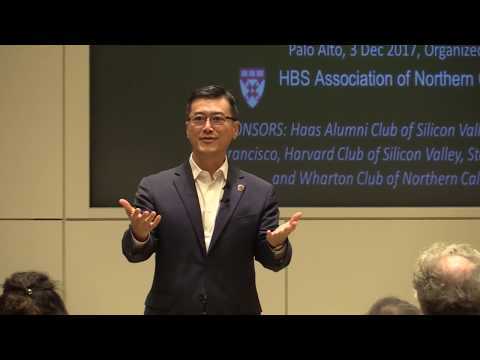 "Mr. Ma inspired a room full of overachieving Stanford students and instructors with a relatable and actionable presentation. His talk included colorful personal anecdotes and a good sense of humor. We were very grateful for his contribution." "Our entire team of administrators greatly appreciated your motivating and thought-provoking presentation. As we work to ensure that every student graduates college and career ready, your advice on how to engage students is valued." 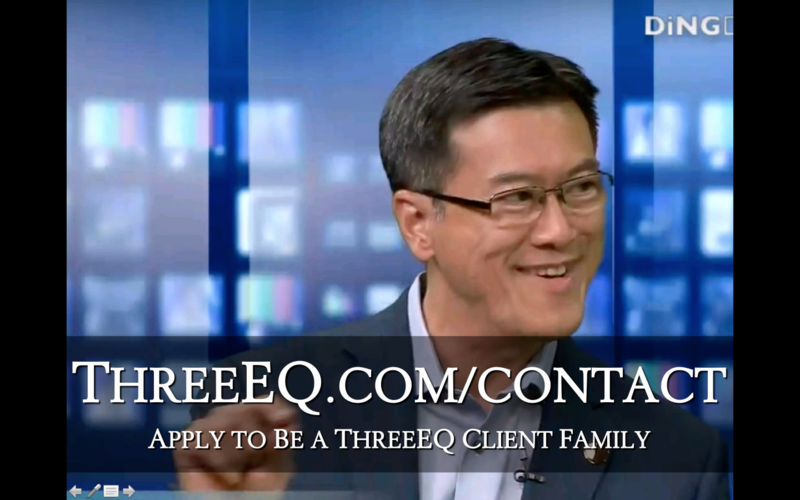 Want More Information about ThreeEQ - Elite College Admissions, Career, and Life Coach and Mentor? 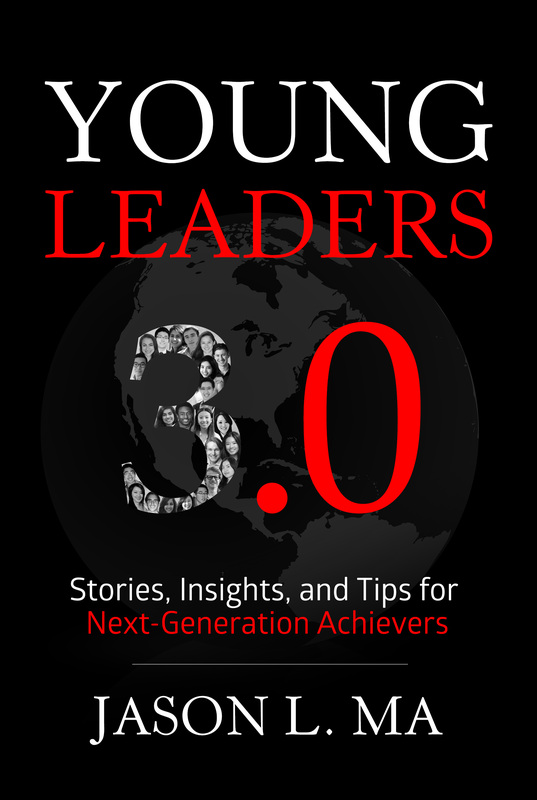 Your request will be sent directly to ThreeEQ and Young Leaders 3.0. By submitting this form I confirm that I am at least 13 years of age and give my consent to be contacted by ThreeEQ and Young Leaders 3.0 by email as well as by phone and/or mail (if provided).